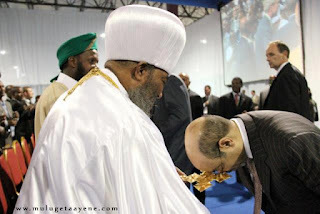 (Deje Selam, August 21/2012):- ETV confirmed today that PM Meles Zenawi has died. The long lasting discussion of his whereabouts are rested now. Ethiopia lost two of its powerful leaders: the premier and the patriarch. It is amazing time. May God rest their souls. Amen. (BBC):- Ethiopian Prime Minister Meles Zenawi has died at the age of 57, state media say, after weeks of speculation about his health. Mr Meles was admitted to hospital in July. The nature of his condition has not been made public. Speculation about his health began when he missed an African Union summit in Addis Ababa earlier last month. Mr Meles took power as the leader of a rebels that ousted communist leader Mengistu Haile Mariam in 1991. Deputy Prime Minister Hailemariam Desalegn, who is also Ethiopia's foreign minister, will be acting head of government, state television said. Three weeks ago, a government spokesman told the BBC that Mr Meles was in "a good condition and recuperating", and dismissed reports he was critically ill. Yigermal!!!! Egziabhier Amlak nebsachewim yimar. May Goodness! O!Lord have mercy upon us. please let us deeply ask the Almighty God for our lovely coutry and its people. please!!!! please!!!! we have to repent from our sin and les us stop standing againest the Lord.may God open the eyes of our eyes. Oh My God! Let God keeo the stability of our country and church. Nebes Yemar, lemimetaw meri kin leb yestelin. This is a time of Bell!! everybody has to listen. unless everybody pray, fast and confess to the Almighty GOD. Death is knocking on the door, please post this message. GOD Bless my country! Amen! Those who defy our monasteries will be gone one by one. God is Good! we ethiopians really feel sad we lost our patriarc and PM meles in one month! Be Ewnet Yih "Ye Egziabher tat" newu! Yehuletunim nefs yimar! Le Betekrstiyan Degegna Abat, le agerachinim Kin Meri yadlen! Amen! Be akale siga yalachihu Abatoch ena ye Poletica meriwoch....ebakachihu kezih temaru ena bego neger sertachihu elefu! Lezich achir edmie.....!!! How do you know they did not repent? If not a christian, let us be a decent human being and say the appropriate thing. May God keep our country in peace. May the Almighty protect our church and our homeland from any problem and civil unrest! They hate you, Ethiopians, and they will continue poisoning your leaders one by one. Can't you see what's going on? For now, you have a Pente leader, and he will play a big role in promoting the anti-Christ in your country. Ebakachehu ye tewahido lejoch!!! entsum enalkis......Ethiopian min nekabin? kidist hagerachenen man ayebin?.........le ETHIOPIA tamagn,asteway,kin,yehone meri yisetat zend entseley!!! Egziabher amlakachin hatyatachinin yikir yibelen. Agerachin Ethiopian yibarklin. Ye Patriarch ena Ye Mengist mircha Besu Beand Amalakachin sim, Yetebarkewin yimretilin! Hulachinim Enisteliy Amen. Ethiopia Egwochuan wede Egziabher Tanesalech! Wetrom mengedegna fit inahuwala newu. I am so ;;;;;;;;;;;;;;;;;;;;;;; b/c of Kidus waldba Egzeabeher yemesge. If anyone of us beleive in God and His unquestionable power, we should just focus on praying than trying to reason out why things happen the way they did. God has given us these day to witness whatever we are able to witness but not because we are any special. I beleive we are favored so we can take every opportunity in our life to repent and get closer to God. To be a loyal citizen to our country and our people and take responsibility by asking God to bring his favor, blessing, marcy upon our country and our people. One thing we should learn from what we have been wittnessing is that God is in charge and we all should behave and reserve ourselves from being judgemental and from talking nonsense. We all are human and in fault so our focus should be on praying to God to forgive us give us a leader who has a fear of God!!! Please pray every chance you get... this is the time for our people and our country. God is watching all of our action more than ever so Please don't miss out this blessing time. May God watch over our people and our country!!! i just couldn't believe what am reading,,may God have mercy on their soul,,WOW WOW EGZIABHERE yemihiret ejun yizergalin,,WOW!!! Have you heard and seen how the blood-thirsty enemies of Ethiopia are warming up their hands to witness another bloodshed? The Islmists in Somalia, the Kenyan PM, the BBC and France 24, they all wish us war and endless suffering. Why do they all hate us? You may ask... if you don't know the answer, you better make some soul searching.